Are you looking for a convenient and safe way to store clean water after you purify it? Do you want a durable water storage option that won’t rust or become too weathered with frequent use? Are you hoping to have a safe way to keep clean water at the ready for disasters or survival purposes? 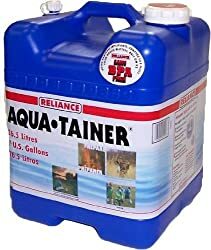 If so, you need a water storage container as part of your disaster preparedness kit or survival experience pack. Shopping for a water storage container can be a little challenging, but with the help of this article, you’ll be able to choose the best emergency water storage for your specific needs. By the time you’ve finished reading through our reviews, you’ll know exactly which container is best for you. But if you still have questions, you can check out our buying guide at the end of the article to help you narrow it down. 2 Why do we need emergency water storage containers? Why do we need emergency water storage containers? Emergency water storage is important, but many people don’t think about it, even when they’re making plans for potential future events. If you’ve ever wondered why you should consider storing water, here are just a few good reasons to keep in mind. If disaster strikes, you might not have access to clean water for a short period of time. For example, if you live in a place where hurricanes are common, you run the risk of being hit by a big one someday. While you certainly would hope this never happens, it’s a good idea to be prepared for water sources to be contaminated in the event of extreme sea water flooding. With water containers, you’ll be ready. In the event of a terrible disaster, it could be a long time before you have fresh water again. No one likes to think about serious large-scale disasters, but sometimes it pays to be prepared. If water sources are compromised for a long period of time, you’ll be ready to keep yourself and your family safe with plenty of stored, clean water. Water storage cans can be used as a great camping water container too. 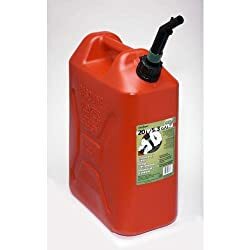 On the lighter side of things, you can use water jugs and containers to keep clean, fresh water at the ready when camping or hiking far away from tap water sources. If you’re planning a big outdoor event, water barrels can help. Last but not least, if you’ll be tailgating or hosting an all-day outdoor party, these containers can keep you well supplied with fresh, clean drinking water all day long. If you’ve ever looked into safe water storage containers, you’ve probably heard a few myths surrounding the right way to keep your water clean. It can be hard to figure out what’s fact and what’s fiction when you’re looking for information about water storage. To help you choose the best water storage containers for your needs, take a look at these myths. You might be surprised by just how many of them you thought were true all this time. They might even help you understand better options for storing your water safely. Water should be rotated every year. It was long believed that water in storage should be dumped and changed every year if it isn’t used, but this isn’t necessarily true. If nothing has caused your water to get contaminated, there’s no reason to change it. Only change it if you have any concern that something might have gotten into your containers during the year. Water should be chlorine treated before storage. If you store tap water, there’s no reason to treat it with chlorine before you store it. It’s already been purified by your local water company, and any other trace contaminants present in it aren’t going to be serious enough to need to be purified with chlorine. Water should be boiled before storage. Once again, if you’re storing tap water, this isn’t true. On the other hand, if you’re trying to store water from a cistern or rain barrel, for example, you do need to boil it. You might also want to go back and chlorine treat it in this case, too. Water should never be stored on cement. This is partly true and partly not. Never store water on cement that can heat up and cause your water container to get warm and pliable. This can allow chemicals from the cement to leach into your water. If all else fails, put a piece of old carpet under your containers and on top of the cement. Water can always be harvested from the local natural water bodies. It certainly can, and if you have a way to purify it, this might work for a while. However, everyone else is going to be thinking the same thing, and rivers can run dry. Get ahead of the group during a disaster by having your own water ready and waiting. While there are a lot of myths about disposable emergency water storage out there, it’s important to learn about the true facts and tips, too. With so much misinformation, you might not know where to start looking for real tips to get you started. In this section, you find a few solid pointers to help you store your water the right way from day one. Read on to find out more. You can use your swimming pool as a water source—for a while. If you have an indoor pool, you’re in luck, because you won’t have to worry about quite as many contaminants for a while. If your pool is outdoor, your water is still chlorine treated and filtered for a couple of days. Use this time to fill your storage cans with pool water as much as you can. Stored water will taste funny, and that’s normal. If it has a plastic taste, this may be uncomfortable, but it won’t hurt you. Just slosh it around in a glass or other drinking vessel a few times to air it out before use. Always account for water not just for drinking, but also for washing and sanitation. You might think that a gallon of water a day is too much for one person to drink, but this also includes washing up, bathing, and flushing any human waste down the toilet. Be sure to save up enough water for everyone in your family at any time. Liquids aren’t the same as water. You might think you can cut back on storing water because you have sodas, tea, Gatorade, or even alcohol. While these drinks are enough to do a little bit in terms of keeping you hydrated, they aren’t going to help like water will. You need water more than you need anything else—even food—in a survival situation. 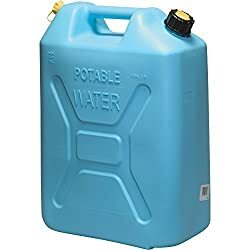 Portable water containers sometimes more important than large containers. 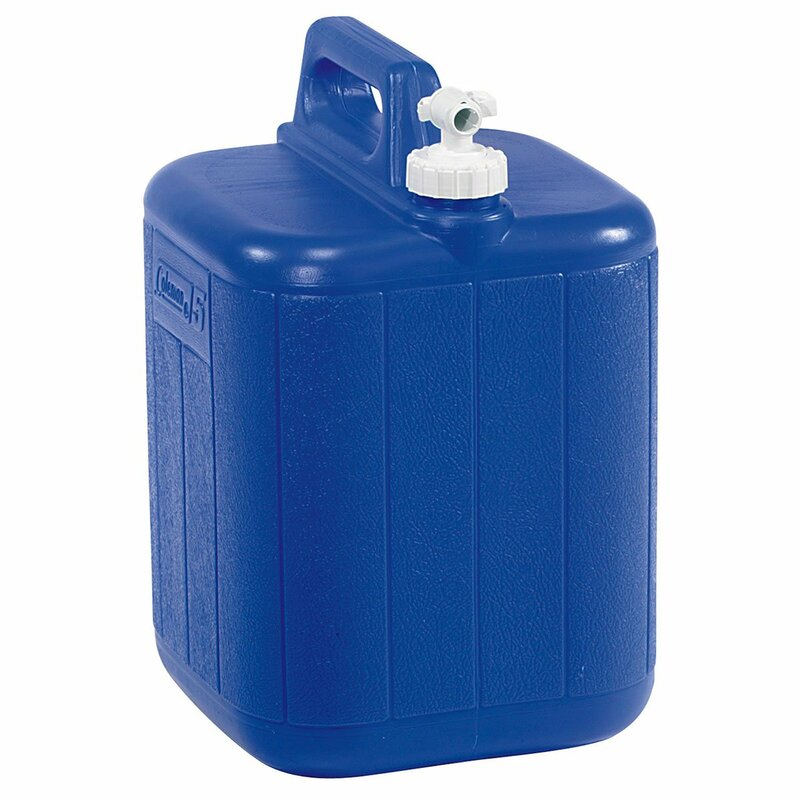 It’s always a good idea to have portable water tanks handy, even if you have larger storage containers too. This way, if you need to move quickly, you’ll be able to bring your water with you. You won’t have to rely on the next place you go having enough water for everyone. Now it’s time for the fun part: shopping! In this section, you’ll find information about the best water storage containers on the market today. 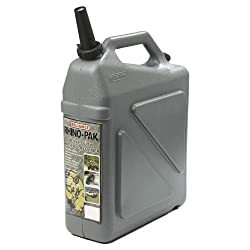 Whether you’re looking for something as small and portable as a pouch or something as durable and long-lasting as a thick plastic jerry can, you can easily find the right solution for you on this list. This is a large water container with a leak-resistant cap and spigot system and a durable design that can stack easily for ample storage space. Bring home plenty to keep your water fresh and ready to drink. This is a very easy to fill jug that can fit under most kitchen sinks. Despite its size (which is larger than many other listed here), it’s very easy to lift and carry when full. The seams in the plastic of these containers have been known to be weak on arrival and split after a few uses. The corners of this container are prone to denting while they’re empty. This large water jug comes with a fast-flowing spigot that makes it easy to access the water inside. Best of all, the container itself is very durable and made from safe plastic that will keep your water protected for a long time to come. Well-known brand name company offers great customer support for buyers. Simple design seals well and can be easily stacked or used for stacking other lightweight items on top of these jugs. Included spigots may be very fragile and weak upon arrival in some instances. The inside of the container could have loose plastic pieces, so it must be rinsed well before use. 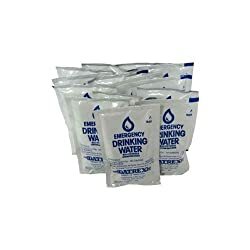 These pouches come pre-filled with their own purified water, which may make them very effective if you don’t have a good method to purify your supply before you store it. Thick pouches keep the individual servings of water in each packet safe from contaminants. These durable pouches will keep water safe for up to five years, and sometimes even longer than this. Included water has a good taste even after being kept in storage for a while. Packets may be very difficult to open, which could be detrimental in a survival situation. Some packs may have an earlier shelf date, which means they won’t have the full five years of shelf life. 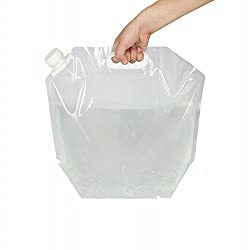 Pick up this easy to use disposable drinking water container to easily hold 100 gallons of clean, fresh drinking water for use at a moment’s notice. 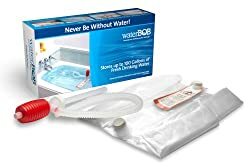 This unique version of water storage can attach to your faucet and work with your bath tub to make it quick and easy to access clean water fast. Plastic used in this product is very safe for food and beverage use. Just toss out the plastic “sock” and purchase a new one for quick and easy cleanup. This container can only keep water clean for 12 weeks, which is a shorter lifespan than some other products on the market today. Some products have been known to arrive with faulty pump siphons and should be tested before you need to use them. Pick up this simple but effective water can for a heavy-duty and durable container that won’t get easily damaged. Best of all, this container comes with a leak proof cap that will keep your water fresh and free from contaminants for years. Small size makes it easy to fit this container under just about any sink. Spout is very handy and useful, and it is not prone to leaking. May cause a strong plastic taste in the water, especially when stored for a long period of time. This can may be susceptible to denting if not cared for properly. This is a food-safe water can that’s very similar to the ones used by the military. This container has a spigot designed for easy use, and it’s made from non-toxic materials that won’t leach into your water. Can be used with a separately-sold siphon to make it even easier to access the water stored within. Smaller footprint but larger size makes it easier to store more water in less space. Include spigot isn’t very useful and may need to be replaced almost right away. Design is a bit bulky compared to some other similar containers. 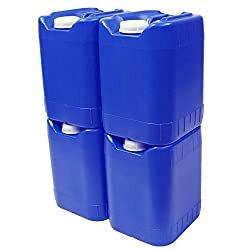 When you want an affordable set of water storage containers that won’t leak and won’t take up too much space, pick up this pack of four. You’ll get a lot of use out of this durable plastic set of well-protected water containers. Easy to store design helps you keep plenty of water on hand for an affordable price. Thick, tough plastic can take a lot of wear and tear without showing signs of damage. Caps have been known to arrive with a bit of a leak. The containers do not come with included spigots, and these must be purchased separately. This thick plastic water container comes equipped with a vent cap and spigot to make it easier than ever to get water out when you need it. Lock this container in place next to one or two more for even better, safer storage. For short-term use, this container can be filled with ice to keep your water supply cool. Pours faster than many other water containers on the market today. The plastic seam on these containers has been known to be weak and cause leaking in some products. These cans often arrive with plastic flakes inside, so they will need to be rinsed out. Even if you have limited space to store your water, these stackable containers can make the most out of a little bit of room. Use them for food as well as water to get the most bang for your buck. Great customer service and quality control from a company that is willing to correct any errors as needed. Does not cause water to develop a plastic taste or strange film during storage. Products have been known to be a little leaky on arrival. May be difficult to empty completely due to the shape of this product. This collapsible water container is made of food-safe BPA free plastic with no toxic chemicals. 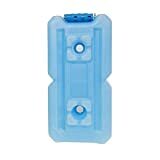 It can fold down into a flat, thin container until it’s filled with water, and it has an easy carry handle that won’t rip or tear. When filled with water, this pouch can stand upright, which is great for hiking and camping. Seams are double reinforced to prevent leaking as well as tearing. Lid may be difficult to close tightly enough to prevent leaking. May be difficult to dry out well after use before putting them in storage. Now that you’ve seen the best containers on the market, you might be having a hard time making up your mind between the many options that are available to you. Keep the following tips in mind to help guide your buying decisions. Are you buying this container to store water for a potential major disaster? Or are you picking it up for camping or hiking purposes? Different uses have different needs, so think about this before you choose a can style. Will you need to store just enough water for yourself, or do you have a family or some friends who will be relying on you to keep them hydrated during a survival situation? Calculate enough water to give everyone in your family a gallon per day for at least two weeks. Some jugs are very durable, but they may also be a lot heavier than the ones that are less thick. Try to decide what sort of tradeoff you’re willing to make between plastic thickness and the ability to carry your jugs. If you’re concerned about major disaster possibilities, you might want to choose a type of water storage container that can be stacked and won’t take up too much space. This way, you can plan for a potentially very long amount of time during which you’ll need to have access to clean drinking water. Although most water containers are more or less in the same price range, some are more expensive than others, and the choice you make may have to come down to your budget. Just because one container is cheaper than another doesn’t necessarily make it worse, however. Also be sure to check how many people have purchased the products you’re looking at. If the reviews are bad, but only two people have tried out the product, you might want to order one and give it a test run for yourself. You never know when you might find the perfect hidden gem of a product. Think about your physical limitations. Last but not least, choose a water container that you know you’ll be able to carry when it’s full of water. If you’re not very strong or have a physical mobility issue, you’ll want to select a pouch or a much lighter can. However, if you have strong arms and don’t mind a workout, a more durable, heavier can may be best for you. So, are you ready to buy the perfect water container for your needs? Now that you’ve looked at all the different aspects of buying a water container, you should be able to choose the one that best suits your specific situation. Remember that all water containers are not the same, but many of them have some similarities. You should also be sure to choose a container that you can carry if need be, so you never have to be separated from your water supply. Always store enough fresh water so that every member of your family has access to one gallon of clean water per day, per person. In the event of a short-term disaster, you should have enough water for everyone to have the right amount for two weeks. However, there’s nothing wrong with storing even more than this if you’re very concerned. No matter which can you choose to purchase, pick up enough to keep you and your whole family supplied with plenty of water no matter what might come your way. Even if you don’t plan to use your containers for survival and disasters, you and your family can enjoy bringing them along on hiking and camping trips, too! Thanks for pointing out that there’s no reason to change your water storage every year if nothing has gotten in to contaminate your water. I can see how people would be inclined to think that water needs to be changed, so being told that it can be left longer than a year is good information. It would probably help to buy good emergency water storage containers as well. Thanks Bradford. It’s true! People tend to change their water when nothing contaminate has gotten in to, so bring the right information is our goals. Nelson.